Dandelions are everywhere right now! I'm sure you've seen them, you might have even had to pull some of these pesky 'weeds' already. Did you know that dandelions are quite useful? Not only are dandelions the first food for bees and butterflies each spring, but every part of the plant can also be used by us. I use dandelion flowers for dandelion oil and the dandelion root for tea. The leaves are also edible, but we'll get back to those other uses another time. Today I want to share how I make dandelion oil. The common dandelion (Taraxacum officinale) is a member of the daisy family. Dandelions are perennial which may come as a surprise, because many people believe they are annuals and just have a really good seed distribution method. Dandelion flowers are known to act as a mild analgesic, so an oil made with the flowers soothes sore muscles and helps with arthritis pain. 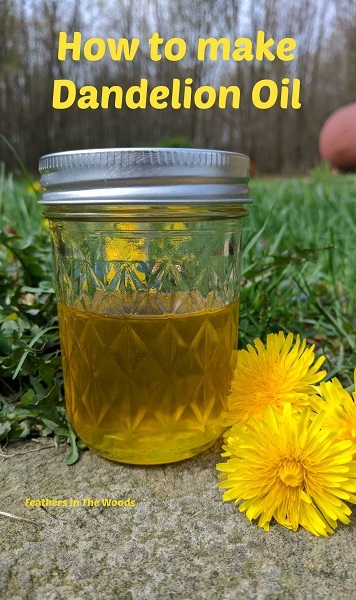 I make dandelion oil to use alone as a muscle rub and in my salve recipes. It's very easy to make and can be used so many ways. First you're going to need to pick dandelion flowers. You only need the head, so go ahead and leave the stems behind. I like to collect the dandelion flowers on a warm dry day. Make sure you collect them from an area that hasn't been sprayed with pesticides. Next you're going to dry them. This time I air dried them. Lay the flowers on a baking sheet lined with a towel. I let them sit out until completely dry. It took 2 days this time, but it was a pretty arid time in summer. You can also pop them in the dehydrator overnight if you have one. (I use this one) Once dry they'll be kind of fluffy looking inside with yellow tips. It's very important that the flowers be dry before adding the oil as extra moisture could cause mold to form on your oil. 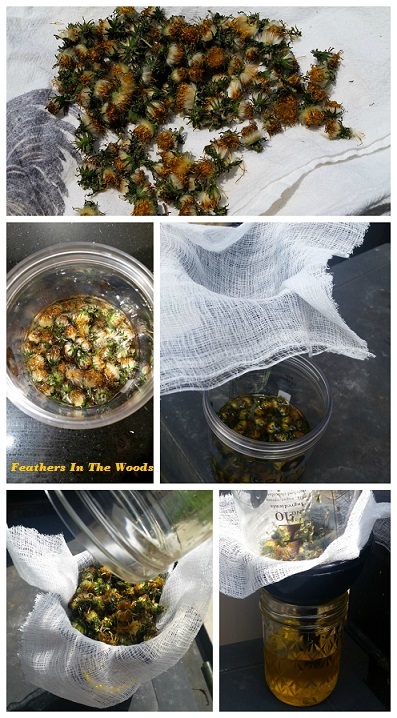 You could also use a dehydrator to dry the dandelions. Pack the dry flowers loosely into a canning jar and cover them with the oil that you want to infuse. I chose to use coconut oil this time because I wanted an oil that absorbs into the skin quickly. I also like sweet almond oil, but I have several infused oils from that already. It was summer when I made this batch so the coconut oil was liquid. If it was solid, I would have had to melt it first before pouring it over the dandelion flowers. Use a knife to stir the flowers which will help bring the air bubbles to the top. Make sure their is enough oil to completely cover the flowers. Cap the jar tightly. Since I'm normally making dandelion oil in summer I let the oil sit in a warm sunny windowsill for 2 weeks. If I can't use the sun method I will place it in a double boiler on low for an hour or so. Shake the jar daily to mix the oil and flowers. When the oil is ready, line a funnel with cheesecloth and place the funnel in a clean jar. Pour the oil and flowers into the cheesecloth and allow the oil to drain out. Cap the jar tightly and don't forget to label it with name and date. (you might think you'll remember but trust me, they all start to look alike after awhile!) Dandelion oil should keep about a year when stored in a cool, dark place. Your dandelion oil is now ready to be used alone or in recipes. I use it mostly for skin rubs or salves, but I'm looking forward to making lip balms with it this season. What will you make with it? I am so glad to see this!!! I use dandelions and I tried to follow someone's instructions on using the heads... only the heads, removing ALL green, etc... painstaking w/ little return and of course, I never did it again! This one is so much more do-able and I am as practical as I can be. I already make salves and tinctures, use herbs, etc and this will be a great addition! Thank you. I will be saving this... and sharing it. Oh wow...that would be a lot of work! No need for all that, just throw the flower heads in whole. As long as they dry out before you use them, this is a 'no fail' recipe. I want to do dandelion jelly next! It sounds so good! Thanks for stopping by! I know Dandelion is so healthy to eat and I have heard of dandelion wine, but I have never heard of the oil. I find this process very interesting. Thanks for sharing this. Visiting from #WasteLessWednesday blog hop. Shared on google, twitter, & pinned. Have a healthy, happy & blessed week! Never heard of this before but if it helps pain then might try it. Natural help is always better than prescription meds. Thank you for attending the #WednesdayAIMLinkParty. I shared your post. I agree so much! I'd rather use something natural any day! It seems so easy to make! I'll have to hunt up some dandelion patches. Thanks for sharing on the #wastelesswednesday blog hop! I never heard of that series, but I just looked it up and I would have loved that as a child! I'll be looking for some of the books for my son! You should definitely make the oil, you'll love it! Awesome, thanks! I'll head over to check it out now!